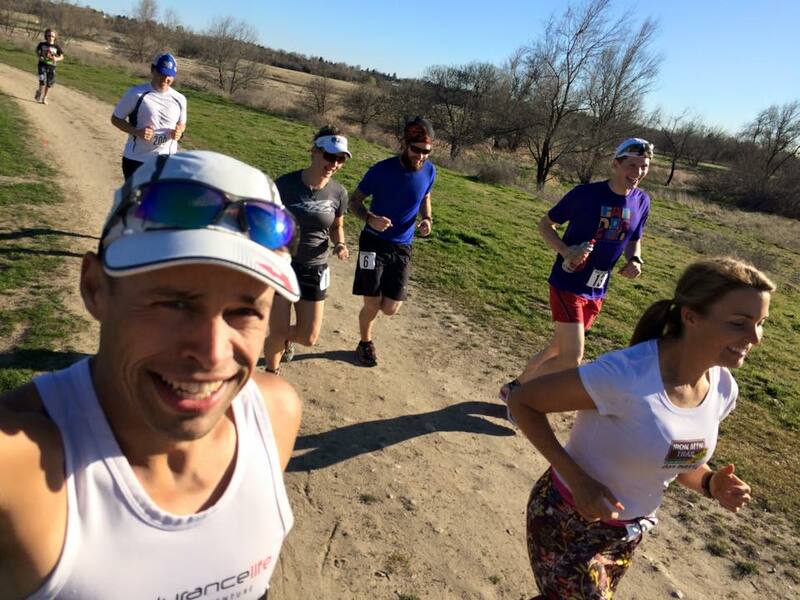 Getting Loopy at the Pickled Feet 48 Hour – Running is fun…at least for a little while. If you’ve talked to me in the last six months, you probably know that I read a book about a little-known time in American history when watching people do the “ultra-shuffle” around a track for six days on end was top-notch entertainment. Obsessed with and inspired by this sport of Pedestrianism, I e-mailed the author to encourage him to attempt an ultra-walk of his own. He agreed, fueling my pride in being a bad influence on others, and signed up for the Pickled Feet 24 hour race in Idaho. Unable to resist, I signed up for the 48 hour and easily talked my friend and fellow pedestrianism fan, Jordan Wirfs-Brock, into joining the 48 hour fun to get a feel for what we might be in for at Infinitus in May. Unfortunately, the author had to bow out, but he’ll be shooting for 50 miles at the Three Days at the Fair 24 hour race and I’m looking forward to crewing him. Please consider donating to his cause here. 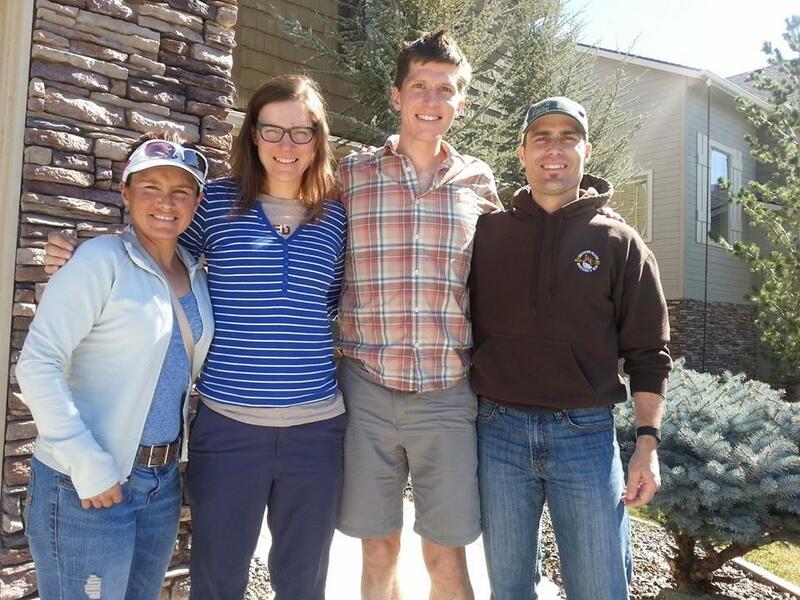 Our hosts, Ryan and Trina Lund, picked us up at the Boise airport the night before race day. Now, I don’t want to gush too much here about Ryan and Trina. I had never met this family before, but they went out of their way for me and we all became fast friends. Jordan and I said to each other many times over that Ryan and Trina really made our trip. We owe them one. Jordan and I sandwiched by our hosts, Ryan and Trina. Over 500 miles between the four of us! After hanging out and taking it easy for the day, we showed up to Eagle Island State Park with plenty of time to set up a tent and personal aid station. Things were low key, with the race meeting cut short because it was time to start running already at 6:00 pm on Thursday. I recently started using one of those fancy schmancy watches and spent the first few loops compulsively checking the thing to make sure I wasn’t going too fast, which I decided was anything speedier than 10 minute miles. I gladly watched the 8 year old girl, Emma, dart off with the lead and ultimately accumulate 100 miles! First lap together as a turn of turtles playing the name game. Night came only a few hours into the race and I was looking forward to enjoying the first night feeling fresh. Cassie loaned me her Petzl Nao headlamp, which has got a lot of hype lately, so I was excited to try it out. I flipped it on and was impressed with its output and feel…until it died in only three hours! I’ll stick with my $8 Coast HL5 headlamp, which is super bright and also lasts three hours. 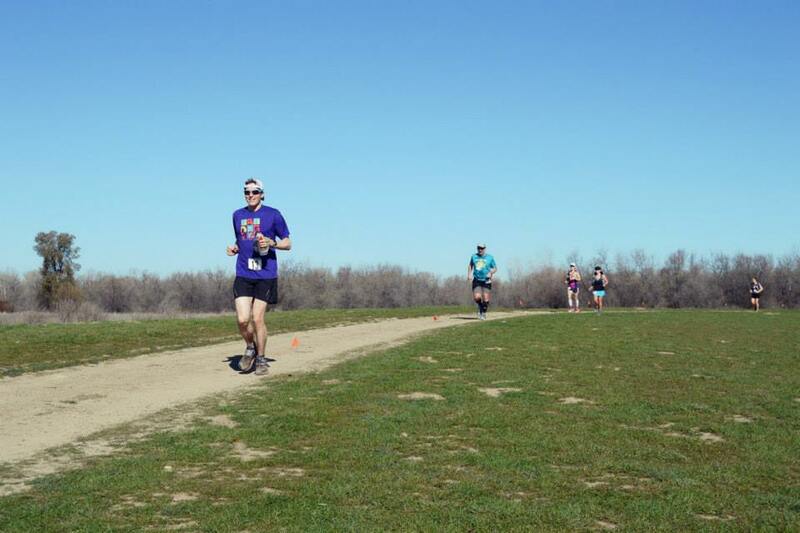 After 25 miles, I switched out one pair of clown shoes (Altra Paradigm) for a pair of clownier shoes (Altra Olympus), which are great for a race like this, but I remember wanting to tear them to pieces with my teeth during a muddy stretch at Bighorn. Gradually, the air became brisk and the fog thickened, transforming the park into an eerie place. 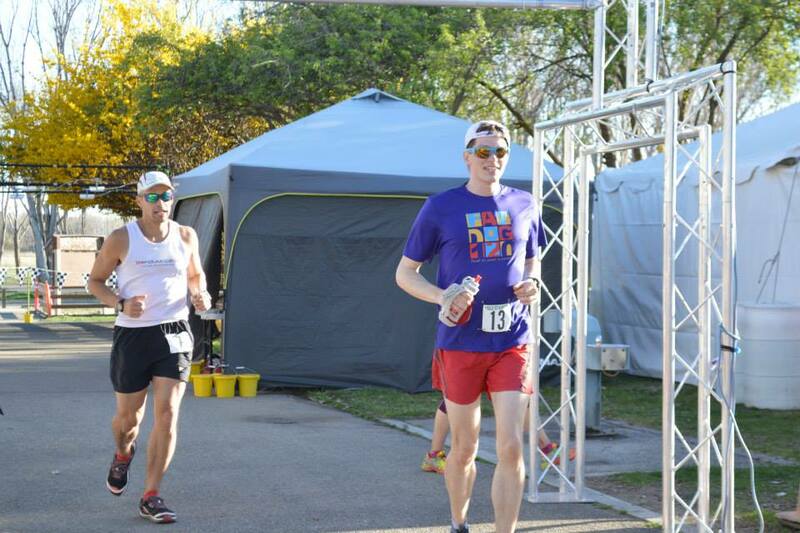 My stomach started hurting around seven hours into the race and it would not let up until around the 24 hour mark. I was using the bathroom after every lap, meaning that I was frustratingly tacking on 3-5 minutes every 2.5 miles. Going into the first morning, I realized I was in a bit of a pickle (har har) regarding my stomach distress. Tums and Imodium were not helping. There wasn’t much in the way of vegetarian variety at the aid station and I was quickly using up all of my favorite foods that I brought. So, it was only a matter of time until I’d be stuck with less than ideal food options for a very long time. Anticipating the upper-70 F temperatures coming our way, I began asking for ice early Friday morning. I was asking so persistently that I became “the ice guy” and was told that the ice was on its way, but it would not come until later that afternoon. The ice made all the difference in the world and sucking on some cubes really helped with my tummy trouble. Crossing the timing mat and about to beg for some ice, ice baby. I hit 112 miles in just under 24 hours, coming into the aid station in time to see the 24 hour folks lining up for their race. At this point, my stomach was feeling better and the temperature was dropping to a comfortable level. I remember feeling super confident that I would hit 200 miles. This goal that seemed so attainable at the time would later disappear, so you see, I’m still learning! Around 26 hours into the race as we entered the second night, I decided to try to take a short nap. I crawled into my sleeping bag and laid there for 15 minutes, but just could not fall asleep. I gave up on trying to sleep then and went to the bathroom to put in a fresh pair of contacts. Suddenly, I felt very lightheaded and needed to sit down for a moment at the aid station. Unprompted, Jeremy Humphrey, the race director for IMTUF, spotted me and put two cups of Coke down my throat and stayed with me until I was on my way. I felt lucky to be taken care of by someone I did not know personally, but I knew he had quite a lot of ultra experience — thanks for your awareness and helping me bounce back, Jeremy! Groundhog day. Not much else to say about endlessly running in circles. I then did something I hadn’t done since smashing my face into a lamp post at mile 25 of a marathon back in 2010 — I pulled out the iPod. I can never get headphones to stay in my ear, but out of nowhere I was overcome with a stroke of genius. Get this. You stick the headphones in your ear where they belong and use a lightweight Buff headband to keep them in place. I should pitch this innovation on Shark Tank. Seriously, this thought felt revolutionary in the moment. I futzed around with the iPod and queued up Rage Against the Machine’s Evil Empire. 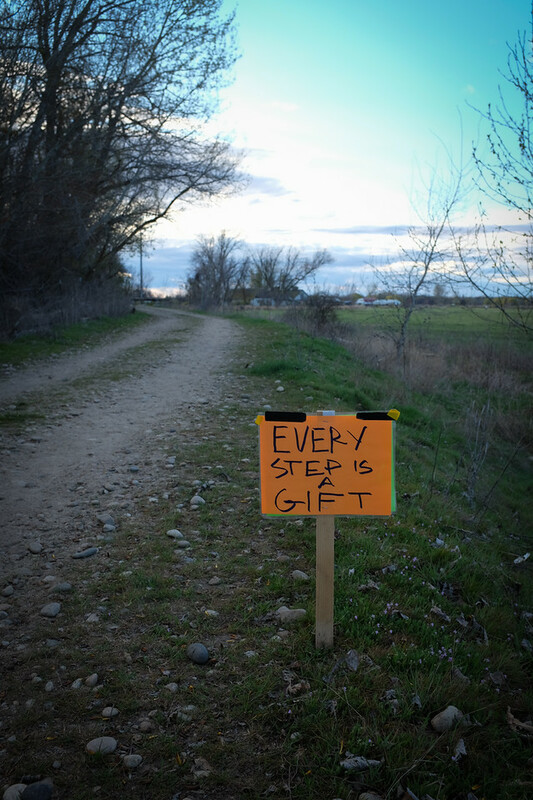 There were a bunch of motivational signs scattered over the course, one of them reading, “Every step is a gift.” Now, that’s all very nice, but I find these signs to be super cheesy and somehow mocking me late in a race. So, I blasted Freedom and instead read, “Your anger is a gift…raawwwwwrrrr!” on the silly sign. Every step is a gift? Your anger is a gift! I felt a little bad about listening to music for a few loops because I was no longer acknowledging fellow runners like I had been for the entire race. Part of my strategy from the beginning for passing the time was to learn as many people’s names as possible and cheer everyone on throughout the event. I think this really worked and I quickly found myself feeling invested in other people’s goals. There was Holley, who refused to sleep until she hit her 100 mile mark and whose kids and grandkids thought she was nuts for doing this stuff. Sheri was another zombie out there and we chummed about how we both hallucinated faces on the grassy trail right by the bridge. Rachael was a veteran Pickled Feet-er and she roped her boyfriend, Evan, into reaching the 100 mile distance when he had never gone beyond a half marathon before. Israel was all smiles and was happy to be there after a grueling 12+ hour drive that he would have to repeat right after the race. Leon has been doing this stuff for years and when asked where he was at (implying mileage) he’d reply, “Eagle Island, I think.” Michelle was one of the steadiest ones out there and she’d push on to make her 100K, as would the Waynes. And of course, Jordan and I were out there slaying it together. Those were just the 48 hour racers. Oh, and Emma the 8 year old mentioned above…100 miles…no big deal. 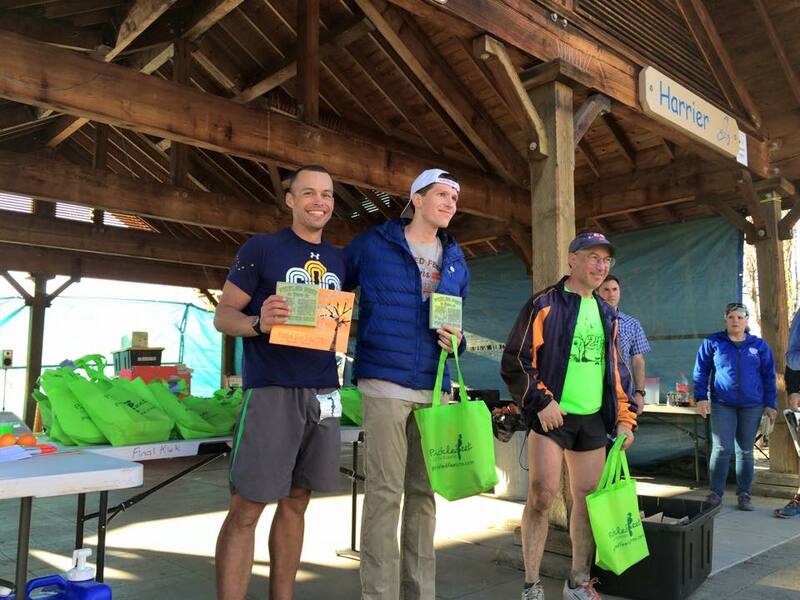 Fixed-time events are relatively uncommon and often viewed as unattractive in the trail running community. Look, I get it. From an outdoor experience perspective, I, too, would rather be romping through wildflowers and mountains than shuffling along a flat loop for two days. However, I think many of us value the social aspect of ultrarunning just as much as the remoteness, which are at odds with each other. If you’re a social runner, let me encourage you to try a fixed-time event. You’ll meet all kinds of people and the feeling of “we’re all in this mess together” is intense. Besides, you know exactly when the misery will end and you can’t DNF. Toward the end of the second night, I managed to sleep for a 20 minute period. I still thought I could hit 200 miles at this point. With less than 12 hours to go, an incredibly strong wind and light rain came through, completely destroying my personal aid station. Stuff was wrecked and pretty soon my race would follow suit. The proof is in the pudding. On paper, I thought hitting 200 miles in 48 hours should be very doable. Turns out it’s harder than I thought. 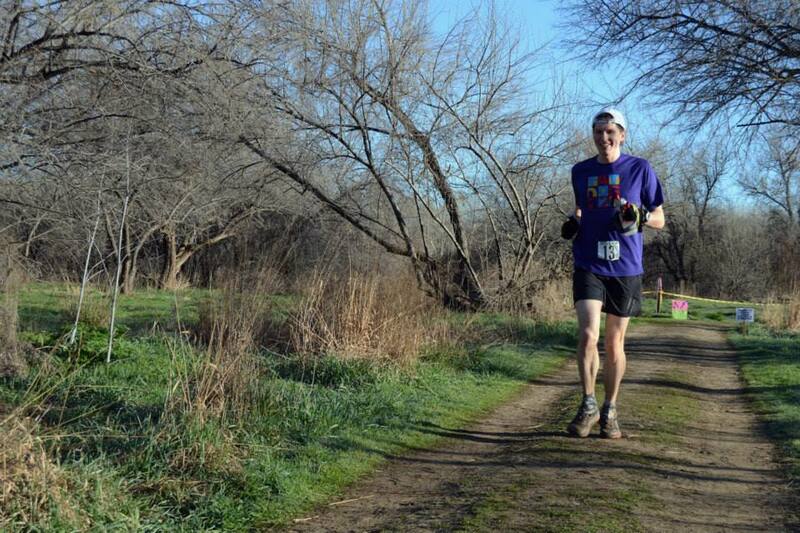 In many ways, this was like my first 100 miler — I fell apart and I learned a lot the hard way. Not long after, simply maintaining a steady walk was difficult. Weirdly, my legs felt great, but I couldn’t help from staggering. I just felt really tired. So, for the next eight hours I tried various combinations of 20 minute naps, laying down on benches, and walking laps. Nothing I tried seemed to pull me out of my funk. The sleep debt I had racked up was too much and I just could not run. I thought about stories I’ve heard of people who can run while asleep on their feet, but I just couldn’t. I really thought that I would be able to, so I was beating myself up about this a little bit. I felt pretty defeated and a tad disappointed, but mostly I was looking forward to it being done. The timing guys and Emily, one of the race directors, told me that the course record was 184 miles. I hit 185 miles with about 20 minutes to spare and called it two days. Immediately after finishing, Jon, another one of the race directors, came over to hear about my race and any suggestions for improvement. The people involved in this race really care and work hard to put on a super fun event with a wonderful community feel. Everyone I talked to had a blast out there. The Idaho running community is something special and I highly recommend the Pickled Feet races! All done with some very cool handmade finisher awards (thanks Rachael and Jon!). It felt really nice to not be running anymore. I’ve had a week to reflect and I’ve thought some about what I did wrong and what I did right. My major faux pas was accumulating a monster sleep debt that shut me down to a snail’s pace. 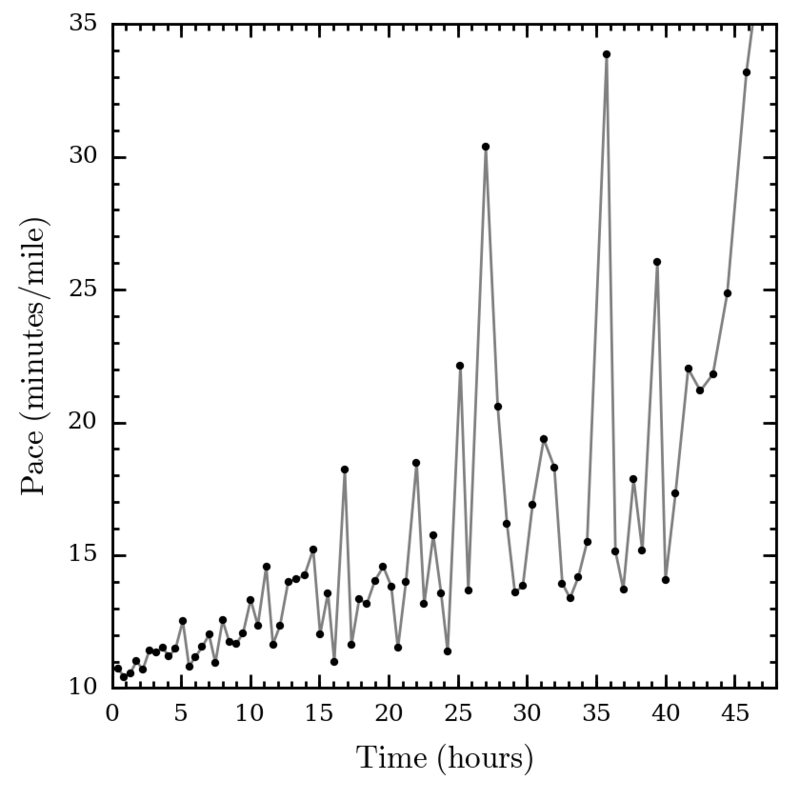 The first time I managed to sleep for 20 minutes I had already been awake for nearly 48 hours. In my hypothetical next 48 hour race that starts in the early morning hours, I’d be willing to gamble with the short naps strategy again. However, I learned the hard way that what I was doing is probably not sustainable for me in a multi-day race like a six-day or the upcoming Infinitus. My other big mistake was neglecting my nutrition. Rather than assuming there will be foods I like, I should either check with the race director ahead of time, arrive with an abundance of my own food options, or have a crew. A crew would have really helped as the race wore on. I found myself spending many minutes in the aid station (or bathroom!) after every lap as a way to recharge mentally before going back out there. Of course, it’s important to take the time to take care of yourself, but time spent lollygagging really does add up! Oh, I also managed to come down with a week long stomach bug after the race, which was pretty miserable. I’m usually very hard on myself, but I’ll admit that I didn’t completely screw up. Hydration and electrolytes were never an issue. I dealt with the heat pretty well on a course completely exposed to the sun and didn’t turn into a lobster like I usually do. I was very good about nutrition for the first 24 hours and think I would have continued to be if I had more food options and/or didn’t run out of the stuff I liked. I was focused and consistent for most of the race and was enjoying myself out there. I escaped completely chaffe-free thanks to frequently reapplying Body Glide and changing into clean clothes every now and then. My feet were in pretty good shape. I changed my lightweight socks and covered my feet with Skin Glide every 8-ish hours. I got some blisters on the tips of my toes, but I think this was because my feet swelled a bit and my shoes were a little snug. Proud of these things I did right, but learned the hard way over the years, I’ll end this race report with a famous quote: “I think I finally have this diaper rash under control.” — Abe Lincoln. Pingback: Infinitus 888 km — I Found My Thrill on Blueberry Hill | Running is fun...at least for a little while.